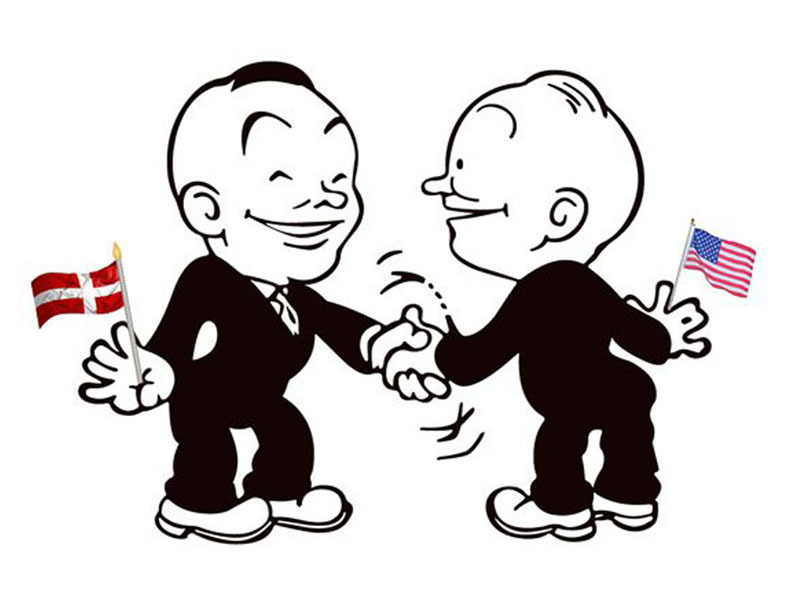 Plan a fun, informative presentation about living in Denmark and Danish business culture – and help Danes and foreigners learn, laugh, interact, and understand each other better. How To Live in Denmark business events about Danish culture are designed to make international employees, spouses, and students feel more comfortable in Denmark and help them understand the Danish mindset. Danes find they understand both themselves and the foreigners around them a little bit better. Our events are educational and fun! See our calendar, or call +45 26 83 64 88 to schedule your event. Danish workplace culture can be a challenge for foreigners who don’t know the unwritten rules of the Danish workplace. Based on Kay’s own experience as a foreigner working in Denmark, this presentation helps bring those unwritten rules to light and helps their Danish colleagues examine their own expectations. We discuss the culture of trust, what to expect from your boss in a flat organizational structure, and the need to drop everything and socialize when your colleagues bring cake. Tailored speech or interactive workshop, 1-2 hours: Copenhagen Dk10500-15000, Jylland/Fyn + Dk1000. Are you welcoming new students or employees to Denmark? Kay Xander Mellish’s presentation “Welcome to Denmark” will explain the basics of everyday life in Denmark – everything from the importance of being on time to the meaning of Jantelov to the best way to make Danish friends. The “Welcome to Denmark” event is an entertaining, informative introduction to Danish culture that your audience of newcomers will enjoy. Are you welcoming new students or employees to Denmark? 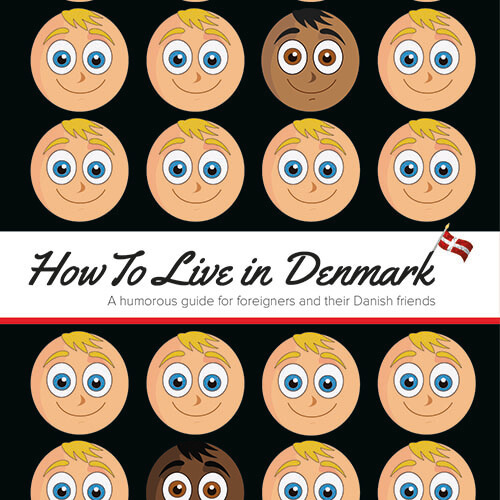 Kay Xander Mellish’s presentation Welcome to Denmark will explain the basics of everyday life in Denmark – everything from the importance of being on time to the meaning of Jantelov to the best way to make Danish friends. The “Welcome to Denmark” event is an entertaining, informative introduction to Danish culture your audience of newcomers will enjoy. After more than 10 years of working in communications for Danish companies, Kay Xander Mellish has seen the same ‘sjove sprogfejl’ over and over. 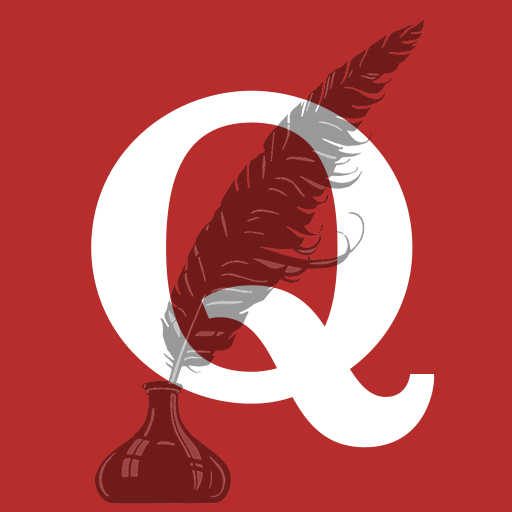 Is it “customer” or “costumer”? “Living in a hotel” or “staying in a hotel”? With a ‘glimt i øjet’, this fun presentation based on her bestselling book “Top 35 Mistakes Danes Make in English” will tell listeners how to avoid the most common cases of “Danglish.” This speech can be combined with “Tips for Working With Americans” if relevant. Interactive workshop, 1-2 hours: Copenhagen Dk10500-12000, Jylland/Fyn + Dk1000. Contact me for special prices available only to gymnasium “sprogdage”. Looking for a fun event for your company or organization? We use the format of TV game shows – which are popular around the world – to put participants at their ease and get them interacting with each other. 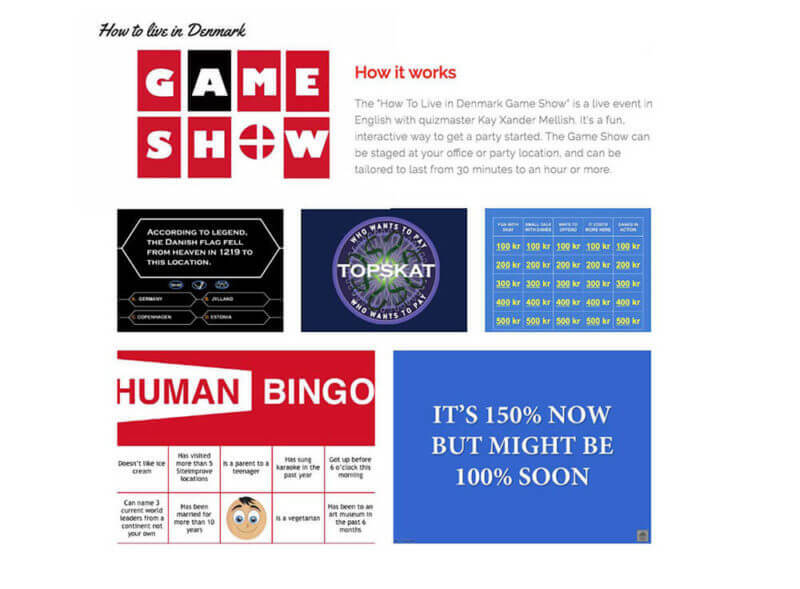 “How To Live in Denmark Jeopardy” is one of our most popular games, along with “Who Wants to Pay Topskat?” (our version of “Who Wants to Be a Millionaire”) and the mind-reading game, “What would the Danes Say?” It’s a great way for foreigners and Danes to relax and have fun together. 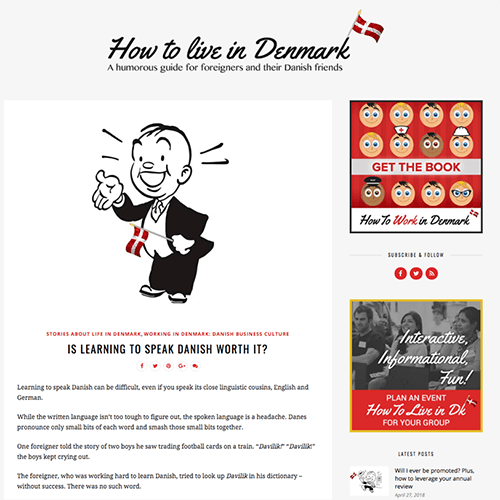 Read more at our How to Live in Denmark Game Show website. Game show 60 minutes: Copenhagen Dk8500, Jylland/Fyn + Dk1000. Game show 90 minutes: Copenhagen Dk9500, Jylland/Fyn + Dk1000. Danes grow up watching U.S. movies and T.V. shows and listening to U.S. music, so they sometimes assume they ‘know’ how to work with Americans – but that’s not always true. 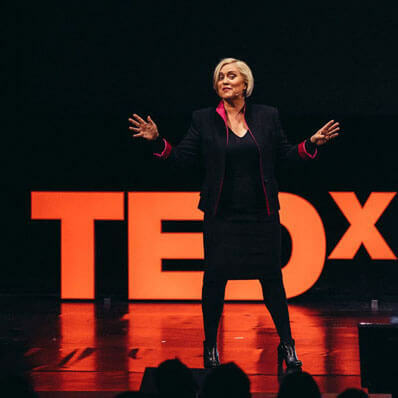 In this presentation, Kay Xander Mellish – an American who has lived in Denmark for more than a decade – talks about how Danes can survive and thrive when working with the multicultural, competitive, sometimes excitable Americans, and how Americans can understand Danish priorities and the culture of dry, sometimes aggressive humor and Jantelov. We can plan a “How to Live in Denmark” event for every audience, location and budget. Get in touch for a free estimate of a How to Live in Denmark event for your group, or telephone us at +45 26 83 64 88 during Danish business hours. Wonder if Kay is available on the day of your event? Check our online calendar. Kay Xander Mellish is an American who has ‘integrated’ into the Danish culture and workplace – and delivers enjoyable events that help Danes and internationals learn, laugh, interact, and understand each other better. An entertaining and interactive speaker based in Copenhagen, U.S.-born Kay Xander Mellish has the ability to see Scandinavian culture from both inside and out. Her perspective makes for a thought-provoking, memorable event. Kay Xander Mellish has lived in Denmark for more than a decade. 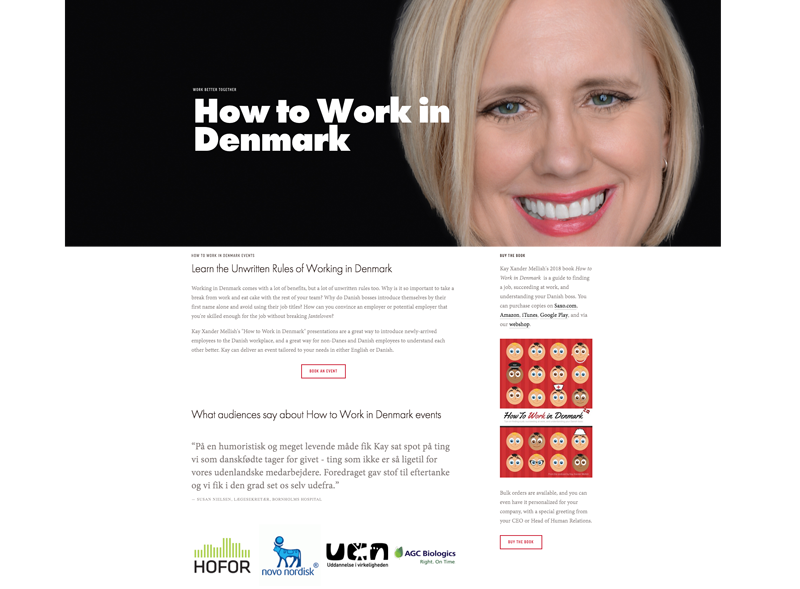 She runs a consultancy that helps Danish companies communicate in English and is a popular keynote speaker on topics that include Danish business culture, how newcomers can fit into Danish society, and the “Danglish” that Danes often struggle with when speaking or writing English. Kay is the author of “How to Live in Denmark” (2014), “Top 35 Mistakes Danes Make in English” (2016), and “How to Work in Denmark” (2018). Call our booking team at +45 26 83 64 88. 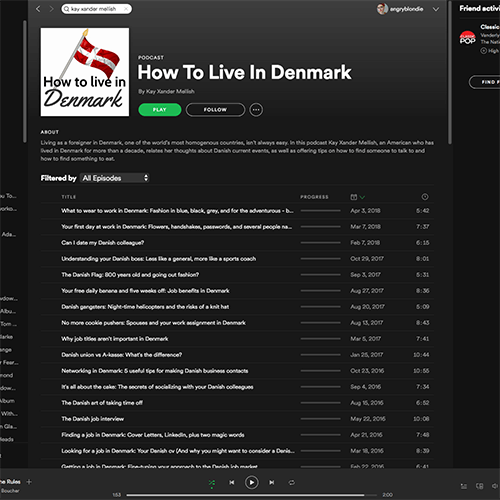 © Copyright 2019 - How To Live in Denmark. Visit the How to Live in Denmark blog.